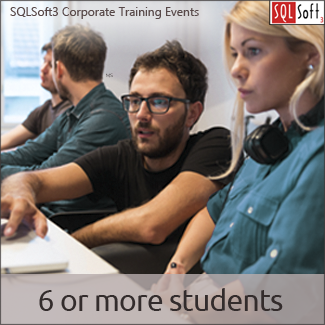 SQLSoft3 has a long history of bringing the right resources together to create corporate training events. This includes working closely with you to determine your training goals, objectives, success measurements, timeline and budget. We can coordinate and deliver the training at your site, a nearby facility, or on-line. All courses (including publicly scheduled courses) can be presented at your facility or virtually at your convenience. Plus, we can customize each course or assemble modules to meet your requirements. An onsite or virtual presentation is economical when 6-8 people want the course and a great value if you have more than 10 who are interested. We’re always on the hunt for expertise relevant to today’s business requirements so don’t hesitate to contact us about topics we may not have on our website today – it may well be an area we are developing an offering for or we’ll do so on your behalf. We have presented on-site training at the major corporations and small businesses around the globe. You design, control, and schedule the course for your participants. Because our private training events can be held at your location or virtually, you can save 30% to 50% in cost, plus additional expenses by eliminating employee travel time and expenses. Since the program involves only your personnel, confidentiality is maintained. You can freely discuss company issues and programs. Your employees may attend all or only the most relevant parts of the course. Our instructors are the best in the business, most with 20+ years of practical, real-world experience. They are carefully selected for both technical expertise and teaching ability and are able provide practical and ready-to-use information. The SQLSoft3 Satisfaction Guarantee: You must be completely satisfied with our program. We are willing to do whatever is required before or after the course to satisfy you. You must be 100% satisfied. If you have questions, please give us a call at (206) 495-9980 or click here to contact us.